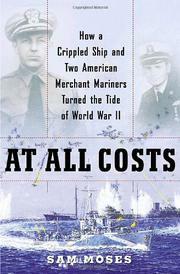 A historical footnote provides a riveting tale of true American grit during World War II. In 1942, the island of Malta was the primary launching point in the Mediterranean for Allied aircraft and submarine attacks against Axis supply convoys. At the height of the North African campaign, Rommel’s tanks prepared to sweep into Egypt, Iran and Iraq. The only thing they lacked was the fuel to get there, and the shortage was equally desperate on Malta. The Allies launched Operation Pedestal, a last-ditch effort to re-supply the base by sending a convoy from Britain through the Gibraltar Strait to the beleaguered island. The convoy, which included the American tanker Ohio and the U.S. freighter Santa Elisa, was anything but a milk run. Vietnam vet Moses (Fast Guys, Rich Guys and Idiots, not reviewed) crafts a thrilling adventure on the high seas, though it takes a while to get started. The book’s first third juxtaposes Malta’s plight against the stories of two American merchant seamen on the Santa Elisa: Lonnie Dales and Fred Larsen, through whose eyes the battle will be viewed in blue-collar detail. Once Operation Pedestal begins, the narrative is all action. The convoy comes under repeated attack, lives are lost, the Santa Elisa is sunk. Dales and Larsen find themselves aboard the wounded Ohio, full to the brim with Texas crude. If they can hold off Nazi attacks and keep their new ship afloat long enough to reach Malta, the operation will be a success. Moses takes readers directly into the heat of battle, demonstrating a strong command of historical detail. Highly recommended for fans of naval adventure.